Talk about an inauspicious start to one of the most anticipated new restaurant developments in recent Brooklyn history: Community activists allege that workers waited until 5 a.m. on the morning of December 28 to commence an abrupt, city-sanctioned demolition of a 16-year-old, 70,000-square-foot garden in Coney Island at West 22nd Street. (The garden has existed, in other versions, since the eighties.) Neighbors tell the Post that the plot’s twentysomething chickens-in-residence were gathered up and placed in carriers that were left on the sidewalk in the predawn hours over the holiday weekend, while bulldozers were brought in to tear down the plots where hundreds of pounds of tomatoes and other produce were grown in a thriving setting every summer. Next door to the parcel is the old terra-cotta landmark building that was once an outpost of the famed Childs restaurant. 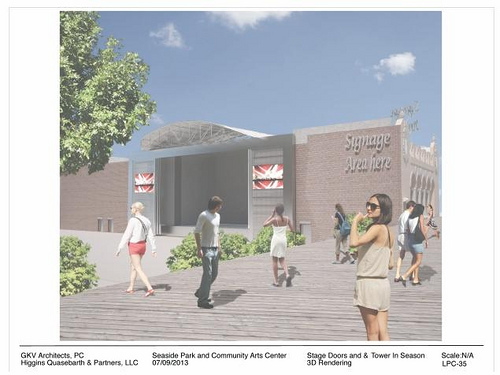 Last week, the City Council approved plans to convert the structure into a ritzy new 5,000-seat amphitheater and year-round dining establishment. A spokesperson for property owner iStar Financial says the garden, which will be turned into a seating area, was “illegally operating” since 2004, when it was decommissioned. Neighborhood groups who support the economic redevelopment of the area are opposed to the amphitheater. “I’m heartbroken, not only for myself, but for the elderly people that were gardening here every day,” says one resident. Others who support the amphitheater proposal say that the demolition, which happened with little warning, was especially cruel. 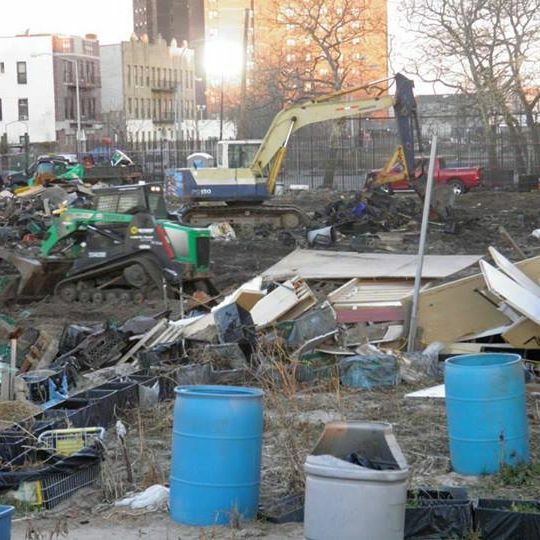 “[I]t’ss barbaric to bulldoze a garden, especially at 5 a.m. on a holiday weekend, no matter the circumstances,” notes Coney Island blogger Amusing the Zillion. Earlier this morning, representatives of the New York City Community Garden Coalition held a press conference outside the site, in which the group alleged that the demolition, which is now complete, took place without regard to environmental law protections.